LINGO is a comprehensive tool designed to make building and solving Linear, Nonlinear (convex & nonconvex/Global), Quadratic, Quadratically Constrained, Second Order Cone, Semi-Definite, Stochastic, and Integer optimization models faster, easier and more efficient. LINGO provides a completely integrated package that includes a powerful language for expressing optimization models, a full featured environment for building and editing problems, and a set of fast built-in solvers. 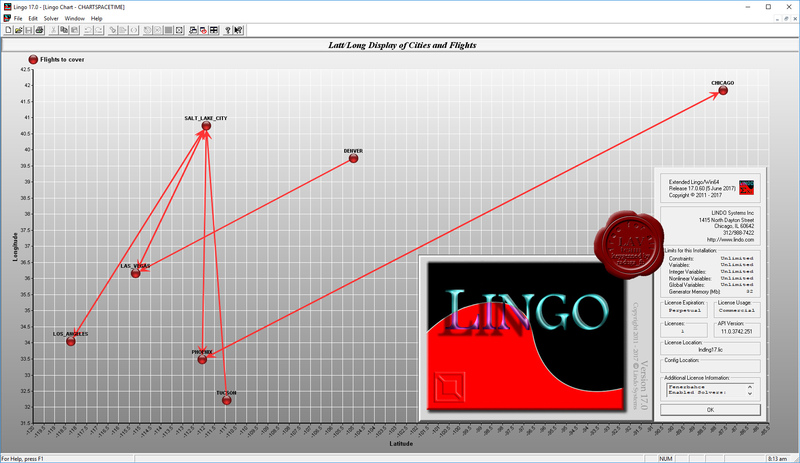 The recently released LINGO 17.0 includes a number of significant enhancements and new features. What'sBest! is an add-in to Excel that allows you to build large scale optimization models in a free form layout within a spreadsheet. What'sBest! 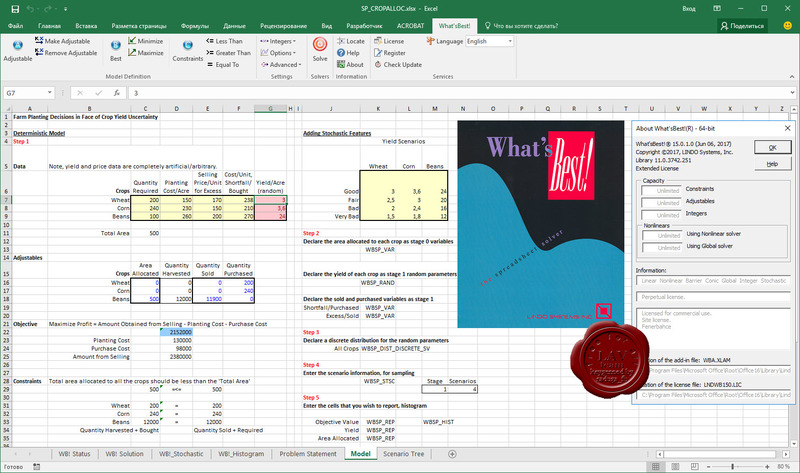 combines the proven power of Linear, Nonlinear (convex and nonconvex/Global), Quadratic, Quadratically Constrained, Second Order Cone, Semi-Definite, Stochastic, and Integer optimization with Microsoft Excel -- the most popular and flexible business modeling environment in use today. The recently released What'sBest! 15.0 includes a number of significant enhancements and new features. Enhancements to the Simplex solvers boost performance on linear models. Large models solve an average of 20% faster using primal simplex and 15% faster for dual simplex. New symmetry detection capabilities dramatically reduce the time required to prove optimality on certain classes of models with integer variables. Performance has been improved on Markowitz portfolio problems with minimum buy quantities, and/or limit on number of instruments at nonzero level. Other enhancements provide faster solutions on certain task assignment-like models. Stability and robustness of the Global solver has been improved through several enhancements to quadratic recognition and range reduction. Improved exploitation of convexity of certain ratio constraints, e.g., as found in heat exchanger network design problems. Several new functions and constraint types are recognized, e.g., the =WBALLDIFF() All Different constraint, for general integer variables. The =WBALLDIFF() function allows one to specify a set of integer variables, such that each variable in the set must have a unique value, different from all other variables in the set.